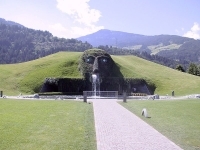 Guarded by a water-spouting giant, Swarovski Crystal World is one of the most popular attractions in Tirol. The museum is underground, featuring 14 interconnected rooms with an eclectic multimedia gallery showcasing dazzling work by Pablo Picasso, Andy Warhol, Salvador Dali, and Marc Chagall, among others, all featuring the distinctive glint of the famous Austrian crystals. Another popular sight is the largest crystal in the world, located in the first room. Just a 15-minute drive from Innsbruck and less than two hours drive from Salzburg, Swarovski is a popular excursion from both cities. The Swarovski Crystal World gift shop has an equally sparkling array of souvenirs available at lower prices than in town, with the opportunity for a tax rebate for foreign visitors.